As usually, when I discover a new replica website I start analyzing everything there is to know about its products, services, policies and liability. Everything is important and every detail matters when the goal is to find the must trustworthy online sellers for high quality replica watches. First things first, from Homepage to Checkout let’s see what Firstreplicawatches.com is all about. The company claims to be able to process the following card payments: Visa, Mastercard, Amex and Discover. This is quite a large selection of payment methods and certainly any one of us owns at least one or two of them. Firstreplicawatches.com is able to ship packages worldwide and the delivery takes about 7-10 business days. The usual order processing time is 2-3 days and a tracking number is available for the package. All packages are shipped with EMS which is a Chinese based company so obviously the packages are coming out of China. There are no surprises here as these days almost everything we buy, from toys to electronics, has the iconic three little words written on it “Made in China”. Firstreplicawatches.com uses the same template as numerous other website I have seen online. Luxuryreplicaus.com, Apricotservices.co.uk and Watcheshere.co.uk are just the ones I was able to notice during my extended researches among Internet based replica companies. Who knows how many other such look-alikes there are on the World Wide Web. One possible explanation for this design coincidence may be that all these e-shops belong to the same company, or it may be that this template is so good that replica companies simply cannot resist from doing what they know best: replicate it. 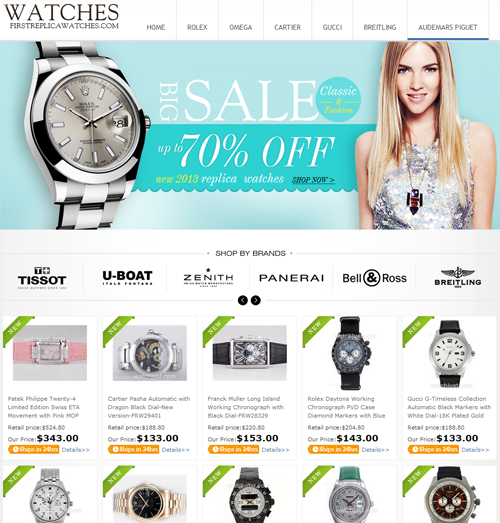 What sets Firstreplicawatches.com apart from the other identical-looking websites is the absence on the homepage of the informative links, like “Shipping”, “Payment”, ‘Return Policy” and so on. This small detail affects the usability of the website and the reputability of the company. A seller who offers transparency regarding its business knows how important this information is for all potential customers and it will definitely post these links on areas of the homepage that are easy to notice. Still, there is a way to get to these pages and that way is to click on the Chat button from the upper part of the page- chat option that isn’t really available- and it will direct you to the Contact Us page. At this point you will see a small menu in the left with links to the “policy-pages”. The product menu bar from the upper side of the page is pretty restrictive. It features only six brands and, as expected, these are the most popular and expensive ones. The rest is displayed in an “All Products” left side menu. The company carries a little bit over a dozen different watch brands, but this is more than sufficient to satisfy the shopping urge of any watch fan, especially if each brand includes a pretty impressive number of different designs. And this is very true for Firstreplicawatches.com. It does provide a huge selection of replicas. The bad part is that these are organized only by collection name, not by price, movement type or design particularities. It’s a real challenge to find a watch when there are no filters or an advanced search available. Here, at Firstreplicawatches.com you will find both Swiss and Japanese movement replicas. Japanese watches are priced at $80-$150, whereas Swiss watches cost over $300. It all comes down to how much you are prepared to spend for buying a replica. What disappointed me was to realize that the product description page isn’t too brilliant. It looks like something put together in a hurry. It only lists a couple of basic specifications for each product. After reading all the return/exchange information posted on the website, the only logical conclusion is that the company doesn’t offer a repairs warranty. And this is bad, really bad. Mostly, because returns/exchanges are accepted only if you report a problem within the first 7 days from the delivery, after which you have a maximum of 14 days to ship it back to China. No repairs will be made on the returned item. It will be replaced with the same model or with another one. Of course, if you prefer a refund then a refund will be issued. Ok, but what happens if the product breaks after two weeks of using it, or after a couple of months? Judging by this policy, nothing. The company will not cover this very possible scenario. Pictures: The pictures look fine, the quality is average and the size is quite small. You can’t enlarge or zoom in on the photos to see specific details so from my point of view, these pictures are just for decorative purposes. The downside is that instead of helping the company to gain our trust these photos manage to do quite the opposite. This is because the watermark we see on all of them is of “watchjust.com”. So the questions that pops into our mind is: “Are these pictures of their replicas or simply some photos copied from the Internet?”. Customer service: What we notice right from the start and what really says a lot about the degree of customer service provided by Firstreplicawatches.com is the Chat button from the upper side of the homepage, chat button that does not work. It simply, directs you to the Contact Us page. There, you are informed that the 24/7 customer care department can be reached only by contact form and by email. Summary: Firstreplicawatches.com is just another Chinese replica website with a wide range of designer imitation watches. Considering this, it seems obvious why the company provides only a 14 days warranty, why it does not offer a viable customer support, why the product pictures are copied from other sources and why the usability of the website is incredibly poor. Ordering from this merchant is a risky choice, but if you are looking for a really cheap replica then it may sound like a reasonable option. Hello, I ordered 2 watches on FIrstreplicawatches.com. after 50 days no watches and no refund! This is a scam. be very carefull. The watches they are selling is very bad. The watches is cheap but very bad quality.My purchased watch with this website was very bad. So I have returned it. They did not back my money. They did cheat with me. Bad people, they sent me the wrong watch and will not answer my emails for a return, bad quality watch. I was cheated, plain and simple, DO NOT BUY EVER!! !